On An Overgrown Path: What is it about Fifth Symphonies? What is it about Fifth Symphonies? 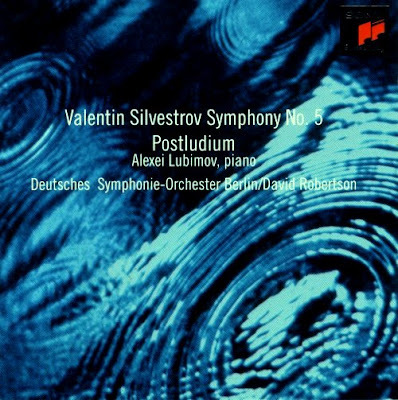 An email from a reader mentioning Valentin Silvestrov prompted me to listen to the now deleted 1996 CD of the Ukrainian composer's Fifth Symphony with David Robertson conducting the Deutsches Symphonie-Orchester Berlin; the ECM-cloned artwork of the Sony disc is seen above. Listening to Silvestrov's remarkable symphony for the first time in several years started me thinking, what is it about Fifth Symphonies? If you want to capture the essence of a composer's style you will find it remarkably often in their Fifth Symphony. Think of Beethoven, Bruckner, Sibelius, Shostakovich, Vaughan Williams, Mahler, Martinů, Prokofiev, Nielsen and Tchaikovsky. Their Fifth Symphonies are not, necessarily, their greatest works, but somehow they capture the unique voice of those composers. The magic number five also applies to lesser-known symphonists. If you want to understand Valentin Silvestrov, Edmund Rubbra, Hans-Werner Henze, Arnold Bax or William Alwyn, start with their Fifth Symphonies. Of couse it's fallible, even if we ignore the many composers who never reached number five. The Fifth of Malcolm Arnold is one of his least typical and least penetrable works, and the Fifth of 15 year old Jay Greenberg received the critical thumbs-down. But the 'golden fifth' rule does apply to a remarkable number of composers and testing it out is a fascinating game. Nominations for notable, or notorious, Fifth Symphonies are , as ever, very welcome. Composers have always been fascinated by numbers. It has been suggested that Bach used Pythagorean mathematics to create the 287 different versions (and inversions) of the main re-la-fe motif that make up The Art of Fugue , Iannis Xenakis ported the golden mean from architecture to music, John Cage threw the the I Ching, and Mahler feared the number 9. Perhaps there is more to those fifth symphonies than mere chance? Talkng of music and mathematics, there is a priceless little book titled Vivaldi and the Number 3. Sample it here. Pliable, I see from the Schott web-site that Matthew Sharp will be performing cello and tam-tam in the British premiere of Valentin Silvestrov’s “Elegy” at The North Wall, Oxford, on November 1. PS. Fantastic comment in your post about J.S. Bach, pliable. Great to see a Silvestrov reference here! He's become one of my favorites over the past year or so. Not sure if thy meet the criterion of "capturing the unique voice of these composers," but Karl Weigl's 5th "Apocalyptic" and Asger Hamerik's 5th "Symphonie serieuse" are both quite good. Two very overlooked composers in general, too. You could playthi game with Ninths too: Beethoven, Schubert, Dvorak, Bruckner, Mahler, Arnold.... Why have Ninth symphonies been a terminating point (whether purposefully or because of the intervention of death) for so many prominent symphonists of the past 200 years? Of course, there are always exceptions, like Shostakovich with 15, but there does seem to be something about Ninths ever since Beetoven. It's a rich field, but, from either side of the pond, I'd nominate Bob Simpson's fifth and Bill Schuman's symphony for strings. To tie in with dennis's comment above, I'm not that old, but I remember seeing an LP of Dvorák's fifth symphony in e minor, "From the New World". -James Conlon conducts the Juilliard Orchestra tonight (Oct. 27) in a program consisting of the premiere of Ellen Taafe Zwillich's Fifth Symphony, and the Mahler Fifth. -Earlier this year, the Boston Symphony gave the first performances of John Harbison's Fifth Symphony, a major work for voice and orchestra that set texts of Czeslaw Milosz, Louise Glück and Rilke on the theme of Orpheus. I found your article about Silvestrov's Fifth Symphony, and other Fifths very interesting. I'm sure you will probably be aware, but I just wanted to alert you to the fact that the London Philharmonic Orchestra are performing Silvestrov's Fifth Symphony live at the Royal Festival Hall on 22 April 2009 under Principal Conductor Vladimir Jurowski. Well, Sibelius and Shostakovitch are something of oddities in that while The 5th does catch them at their perhaps most typical, it is interesting in that for both it is a reaction to their most daring (and for me, much more interesting) 4ths, or a reaction to the public's (expected) reaction to them. Glazunov's Fifth is a remarkable work (unjustly neglected! ), and if you'll pardon the step outside of purely orchestral works, Widor's Fifth Organ Symphony is his best-known work, containing the ubiquitous "Toccata movement! Antheil? Honnegger? Pavlova? Tischenko? Penderecki? And how do we count Hindemith's?